Balancing engineering constraints on altitude and slopes with each candidate landing site’s scientific promise, a board convened to recommend a destination for the ExoMars rover concluded Wednesday that Oxia Planum is the best target for the mission. But the schedule is very tight to have the rover ready for its launch window in May 2018, so scientists also identified potential landing sites if the mission’s launch is delayed to 2020, when Earth and Mars are aligned again to make the journey possible. “Our preliminary analysis shows that Oxia Planum appears to satisfy the strict engineering constraints while also offering some very interesting opportunities to study, in situ, places where biosignatures might best be preserved,” said Jorge Vago, the European Space Agency’s ExoMars project scientist. A working group of geologists, astrobiologists and engineers considered four finalists in a two-day meeting in the Netherlands this week. ESA announced Oxia as the panel’s recommended landing site late Wednesday. ExoMars’ touchdown point must have a low enough elevation to allow the descent module’s supersonic parachute to slow down the craft before landing, and the surface must be relatively flat to avoid confusing radar returns, which determine the capsule’s altitude to inform its guidance system. The lander must steer clear of boulders greater than 35 centimeters — 14 inches — in height, ensuring the craft has clearance beneath the stationary landing module, according to ESA. Winds were also a factor in the recommendation in favor of Oxia. The rover will arrive at Mars in 2019 at the end of the red planet’s global dust storm season. The six-wheeled ExoMars rover, designed to search for signs of past microbial life, will drive off the Russian-made lander after touchdown. 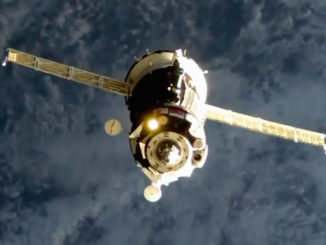 The mission will be dispatched from Earth aboard a Russian Proton rocket, and the European-made rover will descend to the red planet in an entry pod under development led by Russia’s NPO Lavochkin. Landing is set for January 2019, assuming a liftoff in 2018. The rover is the second part of the two-launch ExoMars program, which begins with the departure of Europe’s Trace Gas Orbiter in March 2016 on a separate Proton launch. The orbiter hosts instruments to image the Martian surface and study the planet’s atmosphere, focusing on trace gases such as methane, which could be an indicator of ongoing biological or geological activity. A stationary European lander named Schiaparelli will accompany the orbiter on the Proton launch, aiming for arrival at Mars in October 2016. Located just north of the Martian equator, the rover’s target in Oxia is criss-crossed by sinuous valleys, and a city-sized fan-shaped feature in the eastern section of the landing site could be left behind by an ancient river delta or alluvial fan, according to ESA. Observations from Mars orbiters show Oxia is blanketed by a dark rock layer, possibly from past volcanic activity. The dark material has eroded to expose clay outcrops that likely formed in the presence of water about 3.9 billion years ago, scientists said. The clay-rich rocks date to a time when Mars was habitable, and scientists suggest the overlying volcanic deposits could have preserved any biomarkers from ancient life from the destructive effects of radiation and oxidation. The clay outcrops spotted in Oxia were only revealed in the last few hundred million years, scientists said, as the top geologic layer eroded away. The European rover has a drill to bore 2 meters — more than 6 feet — into the Martian surface to collect underground samples for analysis by the instruments inside the robot to sniff for signs of organics. ExoMars is the first Mars mission to subject subsurface samples to such on-the-spot analyses. 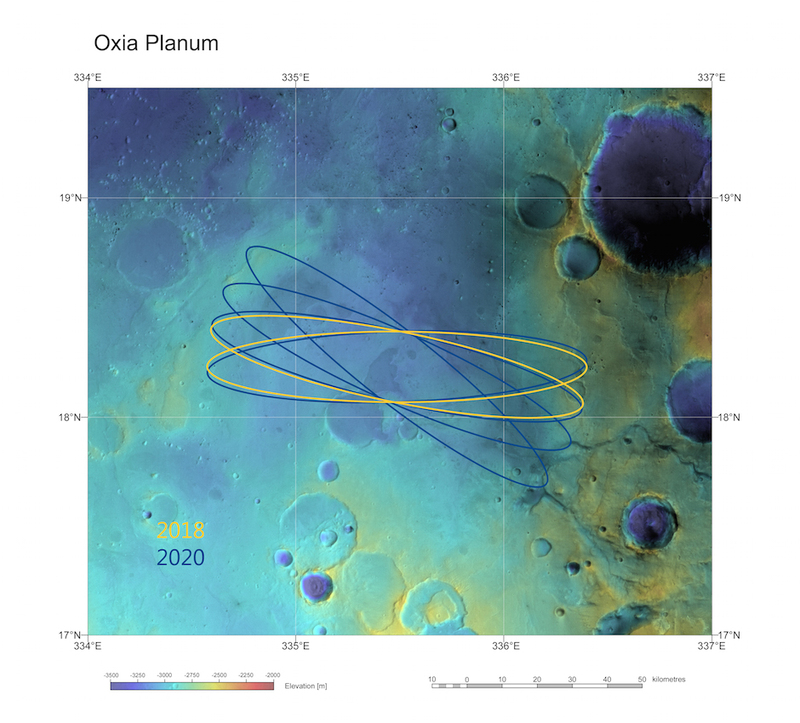 The recommendation by the landing site working group, comprising members from Europe, Russia and the United States, will be formalized about six months before ExoMars’ launch after a thorough inspection of the Oxia Planum landing site with high-resolution images taken by NASA’s Mars Reconnaissance Orbiter. The suite of mapping instruments aboard satellites in orbit around Mars has informed scientists about what awaits the rover at Oxia, but more detailed data is coming. “Compared with landing site selection for previous missions, which relied primarily on the morphology of candidate sites alone, we are today in a much better position to understand the mineralogy of the various sites,” Vago said in a statement. “This puts us in the best position to choose sites that offer access to the most ancient, pristine material that not only preserves a record of early Mars but which is globally representative of processes occurring across the planet,” he said. 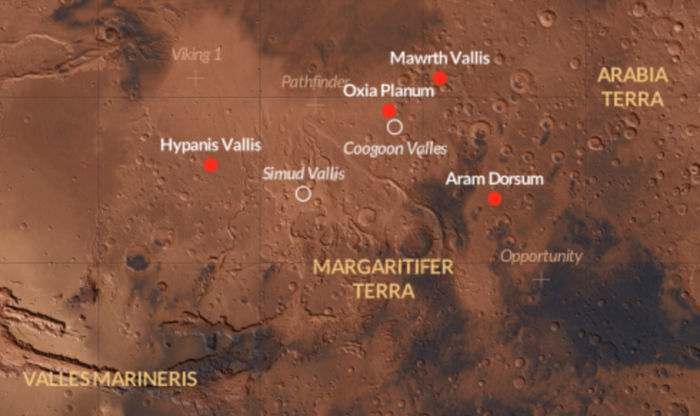 If the rover’s launch is pushed back to August 2020, Oxia remains a top contender for the landing site, along with one of two locations to be picked later between Aram Dorsum and Mawrth Vallis. A fourth site — Hypanis Vallis — was discounted from consideration for the 2018 and 2020 launch opportunities. 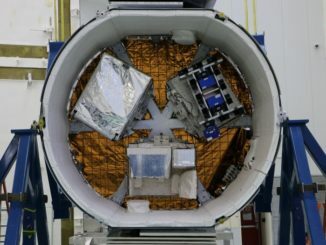 “It made for a challenging decision today, given the quality of the cases for all sites, but we are looking forward to the next stage of analysis as we move closer to the launch of our exciting mission: our rover will search for molecular biosignatures in the subsurface for the very first time,” Vago said Wednesday. 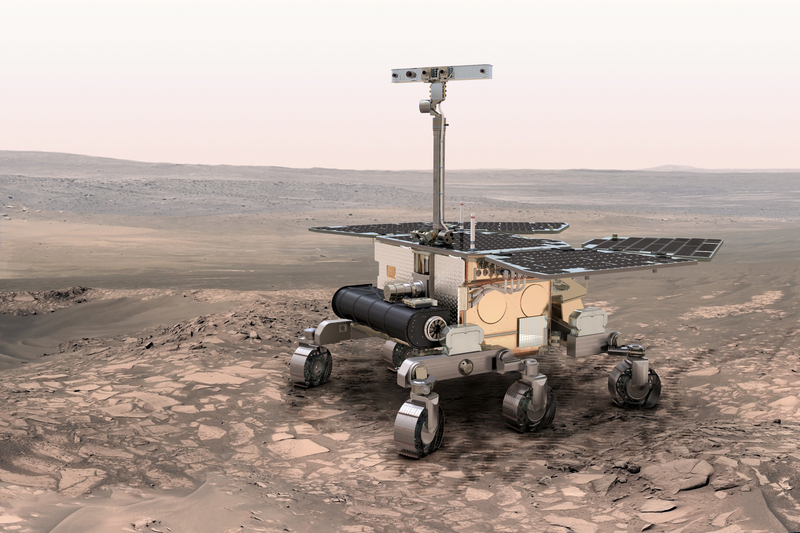 ESA and the ExoMars contractor team, led by Thales Alenia Space of Italy, are finalizing a contract to complete development of the rover and its carrier module. 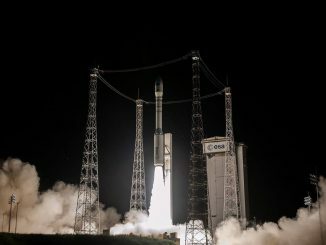 European space officials have said the timeline to achieve a launch in 2018 is tight, and managers hope to decide by the end of the year which launch window to target. The ExoMars program has overcome multiple redesigns in recent years, going from a European-led project to a joint exploration initiative to be developed in concert with NASA. When the U.S. space agency dropped out in 2012 due to budget woes, ESA turned to Russia to provide launches for the 2016 orbiter and 2018 rover, along with science instruments and an entry, descent and landing module to deliver the rover to the Martian surface. NASA remains a junior partner, supplying navigation and tracking support, components for one of the rover’s chief organic analyzers, and radios for data relay.